The New York Times refers to him as “from another planet.” He must be. Theo Bleckmann and I can not possibly share the same anatomy of mouth and throat, let alone brain. But standing alone on the chancel of the Macalester Plymouth United Church on the Macalester College campus, Bleckmann looked anything but alien. In fact he sort of looks like Peewee Herman. And he took us on a Big Adventure. 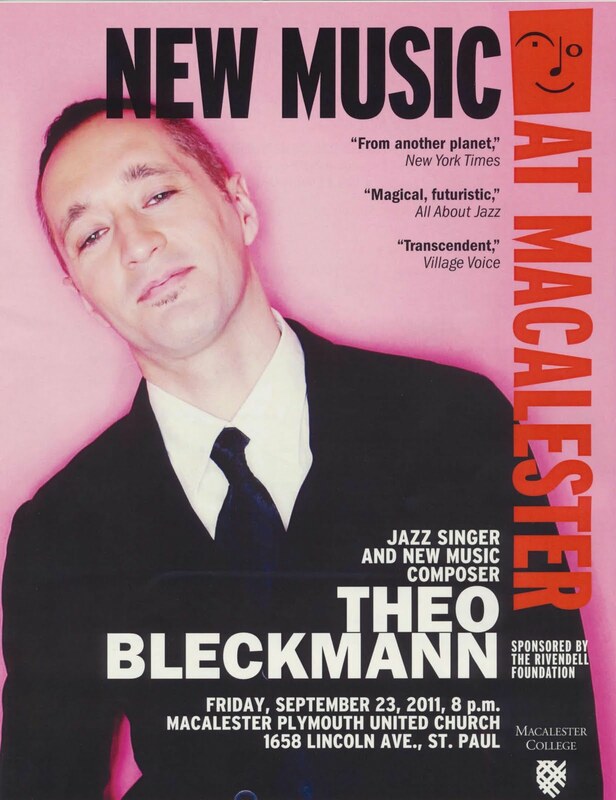 Labeling Bleckmann a “vocalist” is like labeling Picasso a “painter.” Yes, he sings, and yes, he sings very well. He has a pleasant, pitch-perfect tenor, and if you listen to his voice on the more-or-less straight recording of MOSS, you would expect him to be forging a successful career as a jazz or pop singer. But that is not Theo’s direction. He doesn’t follow the experimental path of Bobby McFerrin so much as he hurtles above and beyond it, gathering swirls of electronic manipulations and playtime paraphernalia which he recycles into a menagerie of sounds, some human, some not. It’s McFerrin in a psychedelic wind tunnel. At times the connection to more earth-bound song is obvious; at other times there seems to be little resemblance to a human source. Yet at all times, Bleckmann is riveting, the result jaw-dropping, playful, hilarious, even beautiful. German-born Theo Bleckmann came to the Macalester campus through a marvelous series, New Music at Macalester, supported by the Rivendell Foundation. The free concert followed two days of residency with Mac music students, who filled the majority of seats Friday night. “New Music” can refer to anything from innovative instrumentation to spontaneous creations to unusual sources of sound. Bleckmann fulfills any definition. The program, lasting a little over an hour, included eleven pieces, the majority composed (invented?) by Bleckmann, and starting with the aptly titled “Duet for One.” Thus we were introduced to his ability to create the illusion of harmony with one voice, the sound of singing with electronic loops without any out-of-body apparatus. So maybe it is not really an illusion, but Bleckmann truly can produce two tones simultaneously? Is his voice a chordal instrument? There is some similarity to yodeling, but more so. Other compositions, coming from Bleckmann himself as well as arrangements of works by others (including frequent collaborator Meredith Monk), made use of electronic loops, some which seemed pre-recorded, some clearly created on the spot; Bleckmann at times used a small megaphone (muting his human trumpet), whistles, toys that went inside the mouth… Where is the DVD with close-ups? The effects ranged from drones, Gregorian and African chants, haunted house sound effects, cartoonish voices, echos from deep caves….and sometimes that gorgeous tenor. Even standards were fair game, including Johnny Mercer’s “I Remember You” and Lew Brown’s “Come Love,” the latter a creaky, croaky, teeth-rattling mass of sound effects from a toy-like apparatus Theo stuffed in his mouth. The long “Channel Surfing/anteroom” was particularly clever, loops suggesting the electronic jerking of stop and start, overall a weirdly liturgical soundscape. And in addition to his one-man soundtrack effects (especially prevalent on his “Free4all”), Bleckmann at times resorted to total silence, miming his vocalizations with his rubber-face antics. He closed with a haunting rendition of the classic “Lilli Marleen,” his megaphone creating an echo chamber of (mostly) human harmonies. It was a wondrous night in the land of Theo Bleckmann.